So, I haven't had a lot to say lately. I've been kind of swamped with work and some family stuff. Still, I'm doing okay; I have gotten back to riding, and I've been doing photography again lately. In fact, I got a new photography toy... my first true pro camera body. The new Canon EOS 5D Mark II, a wonderful full-frame body with great low-light capabilities. 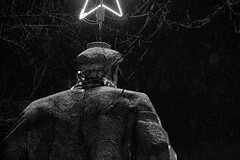 I went around the other day in the snow, taking a few pictures with the new camera, and got one black-and-white picture I really liked of the Lenin statue in the snow. Anyway, I hope everyone has been doing well. I'll try to write more soon. Sure, go ahead, just credit me if you use it anywhere. I don't generally care that much if people use my pictures. I probably should put things back under CC license, but I discovered I'd been snorfed for a few commercial things without attribution, and got irritated (plus several pro photographers told me best to do CC more sparingly). but, yes, I always try to give credit where credit is due.... thanks. I /was/ using CC-BY-NC-SA. I got used for a commercial publication, uncredited, and got annoyed. For a while I put my photostream All Rights Reserved and even watermarked everything. I've stopped watermarking again, and may go back to CC-BY-NC-SA. If so, I'll probably stop uploading the full-res versions of my image (at fairness, in 21 megapixel territory, no one NEEDS the full-res versions of my images) and go to 50% or 'keep within 1280x1280' or something. FWIW 1024x768 prints at 8x10 on my HP OfficeJet just fine; 1280x1024 should be *plenty* for most folks... I wouldn't know what to do with 21mp. :) Sounds like a good idea to me.